Service all brands laptop & desktop, Motherboard& power socket USB socket repairs. 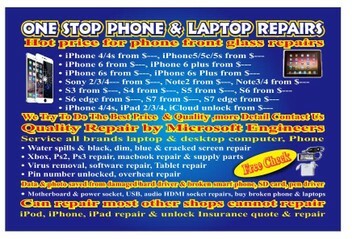 Ipad Iphone repair ,ipad min black screen repair. Smart phone network lock(any courtry) unlock.. smart phone water damage ,no signal no wifi ,battery not last long (electric leakage )etc.repair. .Data & photo saved from damaged smart phone or you delete it by accident . Phone charge port repaire. iphone 4/4s screen change from $65. Overcharged me for assessment when anywhere else are free. Excellent service...You have made one little boy very happy with fixing the broken hinges on his notebook...Thanks one again ! Really happy with this service!!! am recommending to all my friends! my poor macbook died, he gave me a great quote,I paid on pick up.. however something was still faulty, took it straight back and he worked his magic now am super stoked and writing this review on my much loved lappy! love the fact that he gurantees his work! thankyou! Absolutely fantastic service. Have been before and would go back again. Friendly as usual and provides a free quote. He repaired the laptop the next day but was happy to wait until I got paid to pay for his services. I can repair most problems with hard drives but when my 1TB SATA harddrive was damaged - data pins pulled out of the circuitboard itself - I was desperate. This service provider was polite, up front on what he could do and very reasonable in price. The repair was a gamble but to my delight, I now have a working harddrive with full access to data. The repair was speedy and well-done - I cannot recommend this provider enough.